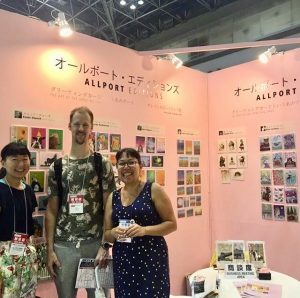 Portland-based Allport Editions, a Hokusei partner company publishing high-quality greeting cards, recently attended the International Stationery & Office Products Fair Tokyo (ISOT). ISOT is Japan’s largest stationery & office products trade fair, offering the opportunity for Japanese retailers and wholesalers to source new products. Allport Editions owner Mackenzie Jeans attended this year’s ISOT, and presented Japanese buyers with a wide selection of greeting cards and other products featuring a number of artists’s works. The Allport booth was designed to convey Portland’s sense of creativity and craftsmanship to the Japanese market.